On Sunday, to mark the fifth anniversary of his reign, Stephen Harper said that his Conservative government has governed on "hope". Surely, Mr. Harper must be kidding? Or does he just think that we're stupid? The disconnect between his entirely delusional rhetoric and the reality of what Canadians have actually been subjected to is, well, laughable. This is the same Stephen Harper who, by specific design, scares the elderly, vulnerable, and new Canadians into believing that crime is out of control on our streets, when in fact, crime rates have been dropping for 15 years. And then, after having instilled fear, promises to rescue us and fix a problem that doesn't exist by spending tens of billions of our tax dollars to build thousands of more jail cells we don't need. And then when his political opponents call him on this lunacy, he calls them "soft on crime". This is the same Stephen Harper who justifies awarding a sole source contract worth $20 billion for new jet fighters because Canadians should be scared that the Russians are coming with their 50 year old bombers! This is the same Stephen Harper that spent over a $1billion putting a security fence around downtown Toronto, and then locking up peaceful protesters in their own backyards without due process. This is the very same Stephen Harper who fired the head of the police complaints commission, the nuclear regulatory watchdog, the veterans ombudsman - all for the offense of speaking truth to power. Here's a man that leads a Conservative government that has instilled fear in the public service of Canada, once a proud and confident group of people. He bullies anyone that gets in his way, and punishes public servants who simply do their jobs. The head of Statistics Canada and Richard Colvin are two others that come to mind. Kevin Page, the Parliamentary Budget Officer, was told that he "doesn't know what he's talking about" by Jim Flaherty, Harper's finance minister. This is the very same Stephen Harper who takes government planes to Tim Horton photo-ops, says it's no problem that Canada doesn't get a seat at the UN Security Council, and spends six months of the people's time on a needless and deliberately polarizing debate on the long gun registry. Harper leads a government that raises shrill and urgent alarms when a boat-full of refugees arrive in Victoria, then quietly grants admission to every one of them into the country. The rationale for Harper's cancellation of the indispensable mandatory long form census was the bogus claim that Canadians were under threat of arrest and jail time. In it's history as a globally respected census no Canadian has ever spent a minute in jail for not filling out a survey. Yet, the Harper Conservatives spent months saying in the House of Commons that citizens could go to jail if they didn't complete it. The Harper Reform Party, Canadian Alliance Party, United Alternative, and now Conservative Party intimidates and threatens. That is there modus operandi. It is a widely acknowledged fact that they have imported Republican and Tea Party attack strategies and honed negative and divisive wedge politics into a high art form. And Mr. Harper has set the broader tone for a government that has no forward-looking program for the country, and has profoundly undermined our national institutions. That starts with shutting down parliament twice, and disregarding his own fixed election date law. This is the same Harper that now warns of the dangers of that dreaded "separatist coalition". Yet, a few short years ago he personally wrote to the Governor General with a request to form a coalition with the very same Bloc Quebecois and the NDP that he tells us we should be very afraid of. This great democrat, Stephen Harper, also sends us regular dire warnings that our economy would be dangerously imperiled and descend into the chaos od instability if - God forbid! - the Canadian people went to the polls to exercise our right to chose a new parliament. Funny, how democracy has waited in the United Kingdom, Austrailia, or the United States in the last year. Harper's implicit message is that it is he - and only he - that has the wisdom to guide this country's affairs. Who the heck is he trying to fool? This from a guy who presided over the largest increase in government spending and deficits in Canadian history. A government of "hope"? Canada has never had a more secretive, all-controlling, and cynical government than the Harper Conservatives. And they think nothing of assassinating the character of Canadian patriots. 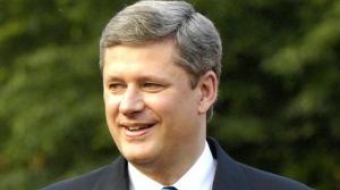 Mr. Harper's roots emanate from the protest movement once known as the Reform Party. His psyche is wired for grievance, not for hope. A talking-point called "hope" from a scripted speech isn't about to change that fact of life. Nor does it erase his five year reign of fear and intimidation. Harper's brand of hope breeds hopelessness. We need a leader who will genuinely help---and not just leave us hoping.